Mix soy and wasabi together. Slice salmon into 4 even slices, lay on a tray and coat with soy and wasabi mixture. Turn on blowtorch and torch until the flesh is pink. Chop all the mushrooms, place in a frying-pan, add soy sauce, vinegar and mirin and sauté. Place potatoes in the oven and roast till soft. Take all skin off and discard. Mash the potato, add flour and make a dough. 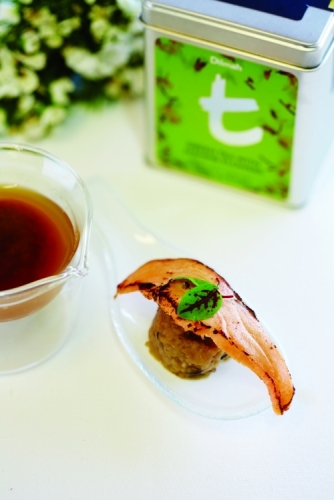 Place Green Tea with Jasmine Flowers in a pot and brew, save liquid for broth. Chop the tea leaves and add to the mushrooms, then add the potato dough and mix. Add flour as needed till dough is not tacky. Roll into small balls. Cook dumplings in broth for 4 minutes till cooked. Place dumpling in bowl or plate and pour the broth over it.